Chadar Trek is well known for being a unique winter journey through Ladakh. It can be termed "Khado Sanglam" by Zanskari vocabulary. It travels through the actual route (Dakini Path) which the people of valley use as the last resort to connect to the outside world when there is no link for several weeks at this time of year because of heavy snowfall. 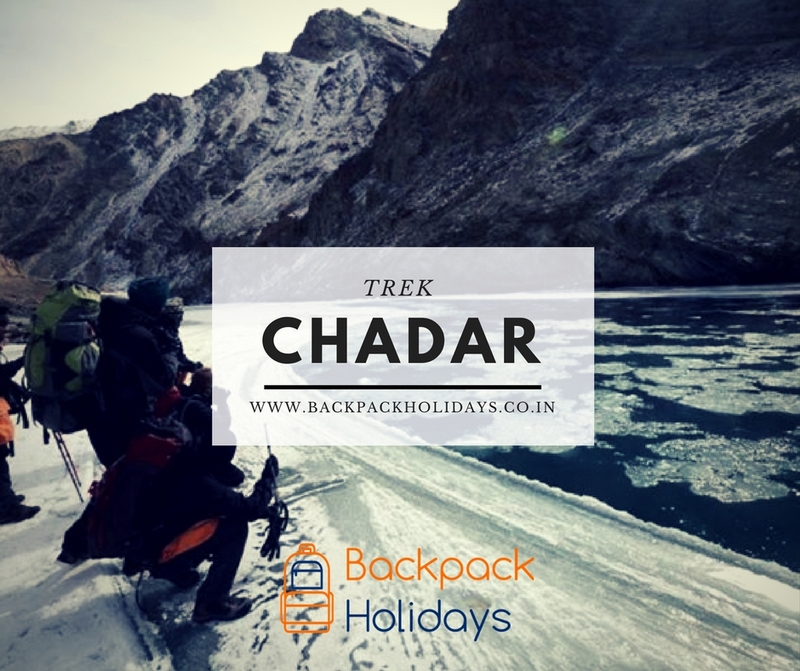 "Chadar" is a common Indian word that means "sheet" and is used to refer here to the sheets of ice formed over the Zanskar river on which we also trek along our route. This specific trek is considered as one of the most amazing one in India due to its unique trekking experience. Chadar frozen river trek offers you some of the most breath-taking sights, ice-peaks along with unforeseen landscapes that are bound to stay in memories forever. The Chadar formations, frozen waterfalls and the whole landscape is different each year. Chadar Trek is a valley trek and hence doesn't take much toll on your legs but the difficult part is the temperature. Day temperatures in Leh and while on trek are sub-zero and usually around -5 degrees. The temperatures during night falls drastically to -25 degrees. The ultimate challenge is to keep yourself focussed in completing the challenge. Day one is acclimatization and rest at Leh to high altitude and harsh weather. Day two onward we start with remarkable journey through the Ladakhi landscape. We return on day eight, rest and cherish the time spend in the remote 'white' wild and pack our bags to leave back to our homes on day nine morning. Day 1: Report at Leh. Acclimatize and Overnight at Guest House. Advisable to come a day before for better acclimatization. Day 2: Morning Drive to Darr / Shingra Yokma [3 to 4 hours]. Trek to Shingra Koma camp [4 km / 2 to 3 hours]. Day 3: Trek from Shingra Koma Camp to Tibb Camp. Lunch at Tsomo. [9 km / 6 hours]. Day 5: Day free to explore the beautiful Neyrak village / Buffer Day. Day 6: Trek from Neyrak to Tibb / Interim Camp. Day 7: Trek from Tibb / Interim Camp to Shingra Koma / Bakula Camp. Day 8: Morning Trek from Bakula / Shingra Koma to Roadhead and drive back to Leh. *NOTE: Environment Fee of Rs. 2040 is additional and to be paid directly at Leh. Meals while on trek (Veg + Eggs). Trek equipments (Tents, Sleeping Bag, Mattress, Kitchen & dining tent, Toilet Tent, Utensils, Rations, etc.). All necessary wildlife permits and entry fees EXCEPT Environment Fee of Rs. 2040. First aid medical kits, oxymeter and oxygen cylinder. Mountaineering qualified & professional trek leader, guide and support staff. Transport from Leh to Trek Start Roadhead and back (in group). Meals during the stay in Leh. Environment Fee of Rs. 2040 to be paid at Leh. Twin Supplement - Rs. 2,500/- per person. Normally Backpack Holidays expects you to carry your personal luggage on your own, if you don’t want to carry your backpack so you can give it to porter, but you have to inform us in advance and have to pay (Rs. 500 x 7 = Rs. 3500) extra in advance. Up to 30 Days :- 90% of Trek/adventure program cost will be refunded. Between 21 - 30 Days :- 60% of Trek/adventure program cost will be refunded. In case the Chadar Trek gets cancelled cause of natural phenomenon or any other reason beyond our control, we shall arrange for alternative treks like Lamayuru Trek, Zanskar Valley Trek or the Indus River Trek looking at the situation and possibility of the events. ?If the participant is unwilling to go for the alternative trek, there would be no refund or no voucher issued? as for Chadar trek, all the services have to be arranged before hand and can not be shifted to any other date. Up to 10 Days:- 30% of Trek/ adventure program cost will be charged. Less than 10 Days:- No rescheduling allowed. - You can leave your extra stuff at Leh and take only necessary things to the mountain, once you are back from the trek you can collect it from our Guest house. - Trek is led by a professional trek leader. There will one trek leader, local guides, one cook, helper and supporting staff so no need to worry about the safety part. - We provide only vegetarian food during the trek so kindly do not expect non vegetarian food. - Kindly re-check the trek essentials list while packing your bag pack. - Carry enough layers with you as you may never know what nature has in store for you. Don’t stretch it too much, keep it simple. - For all those photographers and mobile junkies, do carry extra batteries/memory card as batteries tend to drain faster in cold environments. Mobile signals will not be available during the trek. - Do carry Glucose-D/electrolytes/candy. These things will help you to get back the taste on your tongue and will keep your spirits up. Any ways we will give you enough refreshment to get going on the way. - Wind-cheaters/Ponchos for protection against wind/rain/snow. Will also protect your thermals from getting wet and damp. - Floaters/Slippers are a strict NO. Wear good traction ankle covering shoes. Floaters are good only while answering natures calls. - Carry extra plastic bags in which you can put in your wet clothes/garbage/etc. DON’T LITTER AROUND, KEEP IT CLEAN. - Remove all your jewelries at home and carry good sun glasses and sun creams. - ALCOHOL IS TOTALLY PROHIBITED DURING THE TREK. Even though if you wish to carry alcohol or smoke, please do it at your own risk because sometimes it has proven FATAL at high altitudes. - In case of Emergency:- We have enough no. of support team members during the trek but in any case any casualty happens during the trek, we provide the basic first-aid, oxygen cylinder and stretcher to bring down the casualty to the road head. For rescue assistance you have to pay on your own. - Backpack (60 – 70 L) with sturdy and comfortable shoulder straps and supporting frame. Add-on poncho can be considered to keep it dry. - Trekking shoes. Ensure the shoes are well broken in before the trek. Shoes should have good grip, ankle support and waterproofing. - 2 x waterproof track-pants. Track-pants are light. Plus when things get cold you can wear one over the other. DO NOT bring Jeans, Shorts, Capris, etc. - 3 x cotton t-shirts – full sleeves preferred. - 1 x Fleece jacket; a woolen sweater would be an alternative. - 1 x Wind-proof jacket. - 1 x Down / Feather / Heavy jacket. - 2 pairs x thermal inner. - 3 pairs x sports socks and 2 pairs x woolen socks. - Woolen monkey cap / balaclava that covers the ear. - 2 pairs x woolen gloves and 2 pairs of synthetic gloves (water proof). - Sun Cap and Sun-glasses which cover your eyes well. c) If either of the above is not possible, wear your spectacles and carry a big sunglass that can be worn over your spectacles. - Towel (Thin, quick drying type). - Cold cream and sun screen lotion (SPF 40+) and one Lip-balm. - 2 x Water bottles (1 L each). - Torch with extra set of cells (head lamps preferable). - Personal toilet kit (minimal) and toilet paper. - Slippers / sandals (for walking around campsite, you can share this with tent mates). - Some trekkers feel loss of energy more than others. While there is adequate food provided on the trek, carry dry fruit combinations as light snacks. Glucon-D can help in instant energy and considered good in AMS as well (not proven). - While packing, use plastic bags to compartmentalize things and carry few extra plastic bags for wet clothes. NEVER LEAVE ANY PLASTIC OUT IN THE NATURE. Plastic is only for use. If you’ve spare plastic bag, free hands and some will, we’d recommend you collecting non-biodegradable waste from the trail and bringing back as much as possible. We all can do our bit for the Mother Nature. - Leave your denims behind – these are ill suited for treks and add weight. - Do not carry any disposable plastic bottles (Bisleri etc. ), plastic wrapped/packaged items. Do not bring any non biodegradable material. - After packing, weigh your gear. It should be in the range of 7-8 kg – preferably on the lighter side. Anything heavier, you will need to iterate and remove what is not essential. - Carry light and what is essential. As an example, toothpaste should be bought in small size (that can last you 15 days). The list of things mentioned here are exactly what you need and nothing more. - To protect yourself from cold, dress in layers. Two T-shirts worn one over the other is warmer than a T-shirt that is thick. 3 T-shirts worn one over the other is as good as a full sweater. This is just a guideline. If you are prone to cold carry an extra sweater. - The trek dates / itinerary / plan are liable to be changed in case of non viability or hostile weather conditions. So, be prepared and enjoy the time. An identification card (like driving license, voters ID card etc), along with a photocopy. A medical and disclaimer certificate. The documents are mandatory. Without them you will not be allowed to trek. For any trek physical fitness is a must. Make sure you start to train yourself a few weeks from the commencement of the trek. Starting from brisk walking to be able to run comfortably for 4-5 kms. in 30 minutes ensures that you are ready to take on the harsh conditions of a high altitude trek. If you are just fit, you will still be able to do the same trek, but the difficulties you face will be harder. So it is best to be 100% fit for you to enjoy the trek without worries. LEH ARRIVAL - You need to arrive to Leh on this day (latest). The reporting place is our hotel / guest house in Leh and the address of the same will be provided. You need to come to the place and you will be allotted with your room for the night. You'll be greeted by our team member and passed on with some quick instructions for the first day. This day is for rest and acclimatization to the altitude and cold temperature. We will have detailed briefing about the trek and a quick fitness check. You'll be served with hot and fresh dinner and doze off for tomorrow's trek. Note: It is advisable to come a day early. Anyone coming a day early, can inform us and we'll make extra night's stay arrangements. Charges will be additional. LEH - NIMMU - CHILLING - SHINGRA YOKMA ROAD-HEAD and TREK TO SHINGRA KOMA: Today, after breakfast we drive with small brief halt at Nimmu (Sangam), the magnificent confluence of River Zanskar and Indus. We get first glipmse of Chadar from here. We can see the difference that slow flowing Zanskar is frozen and Indus is still flowing much better. We cross Chilling and drive to the roadhead. It may vary depending on snowfall or landslide. We gather at the roadhead and start our journey down to the river. Touching the Chadar first time, we start the trek for about 2-3 hrs along the magnificent frozen river Zanskar till Shingra Koma campsite. Shingra Koma is a big camping ground on your right as you walk up stream. Its right below a huge stone wall which is straight out of a hollywood movie. The Zanskar river takes a beautiful turn right in front of the camp site and sharp peaks rise on the other side of the river. Our trek leader and guide will keep on teaching you about various types of Chadar and different ways to walk on it. Overnight in the camps. SHINGRA KOMA TO TIBB CAMPSITE: Today is a long day and we start early. The whole walk might take about 7 to 8 hours including lunch break. Today we would cross Tsomo Campsite (named after an imaginary Zanskari girl), a narrow but magnificent stretch called Tsomo ka Tutu (Tsomo's throat), a perpetual non-frozen fall with green moss around called Tsomo ka Nakung (Tsomo's nose). By cross by multiple frozen waterfalls at distant. We reach Tibb by late afternoon. Tibb means under shadow in local dialect. Called so because the caves at Tibb are under shade for almost whole day. But it has bright patches in campsite and it is where we camp. Overnight in camp. TIBB TO NEYRAK CAMPSITE: Again one of the magnificent days on the Chadar trek. The vistas are stunning though as we pass through giant frozen waterfalls, ice cliffs and one may even catch sight of the mountain fox. We have our lunch at a mid camp where another frozen stream joins in, Yokma do, it is about 3 hours from Tibb and 3 hours from Neyrak. We camp tonight at Neyrak. After reaching if we have sufficient time and if the Chadar connection between camp and waterfall is firm, we would visit the waterfall on this day, else we will keet that for tomorrow along with Neyrak village visit. NEYRAK (also written as Niraq / Nerak / Nirak / Nearak) VILLAGE VISIT OR BUFFER DAY: This day is for visit to the beautiful village of Neyrak. We leave Chadar that is going further to Zanskar here and take the bridge over frozen river to cross over to the left and join steep 1.5 - 2 km trail to the village. The village has two parts - lower and upper which are situated 500m apart. Both area has DSPT (Satellite phone) from where you can call back home. Charges are around Rs. 8-10 per minute. Village is beautiful but harsh winter lifestyle can be imagined. At the topmost part there is a Gompa. The whole village takes about couple of hours to visit. If we are lucky, we might find a family to serve us hot butter tea with khambir, Ladakhi bread. We come down and camp at Neyrak. THIS DAY IS ALSO A BUFFER DAY. IF FOR ANY REASONS, WE ARE UNABLE TO FOLLOW OUR PREVIOUS SCHEDULE AND FALL BEHIND THEN WE CAN MAKE IT UP ON THIS DAY. IN THAT CASE WE WILL ONLY DO VILLAGE IF TIME ALLOWS. NEYRAK TO TIBB: Though technically it is the same way back, it is also quite different. The Chadar or the blanket of ice that is forming on the River Zanskar is always changing, breaking up and forming itself again. As the Chadar dynamics are ever changing, the same route and place would look and feel different as the texture and conditions change. If the whole group is fit and walking fine, we might push this day ahead and camp at an interim camp ahead of Tibb. This will allow us to move early next day and beat the rush. TIBB to BAKULA: Today we trek from Tibb / Interim Camp to Bakula. Bakula is about 1-2 hours of walk from the Shingra Yokma camp or the road-head. It is an uncrowded site with hardly any groups preferring to stay here and this makes our last day special away from the crowd. Today is the last night on Chadar so we do our traditional parting ceremony here (if not done at Neyrak the last point) and spend good time with whole staff. BAKULA - CHILLING - LEH: Last day of our amazing trekking experience. We trek from our campsite in Bakula to the road-head. If someone is willing to take a dip in the icy cold waters, it is always the last day as we head back home. Shingra Yokma is a great and safe sight for it. We also have our lunch here before the vehicles come and we drive back to Leh. We stop by at Gurudwara Pathar Sahib and thank everyone for the safe and memorable journey. We celebrate at Leh and spend overnight at Leh. DEPARTURE FROM LEH: Today morning, we depart from Leh to our destination with some wonderful and lifetime memories.